ISM 2019 featured some excellent procurement advancement and transformation case studies, such as “The Challenges of a New CPO” covered in an earlier dispatch. They are tales of aligning people, process and technology to create business value. Since getting the people side right was consistently mentioned as the most crucial — and fickle — element of the triangle, I was delighted to attend the session on building a high-performance procurement team by Dr. Clark Perry, a director at AlixPartners. Track chair Eric Germa, senior vice president of strategic procurement at Macy’s, had alerted me to Dr. Perry’s session in advance. A seasoned transformation leader himself, Germa’s recommendation was worth noting, so I made sure to attend. The large meeting room was rapidly filling up, a sign that many attendees are keen on the subject, or perhaps word had spread about Dr. Perry’s effective, entertaining and engaging speaking style. Right out of the gate, Dr. Perry asked us: “What is a team?” He set the record straight: We all use the term ‘team’ far too loosely. A group of commercial professionals is actually not a sales team but merely individual contributors doing the same job. “A team is a small number of individuals (no more than 8–12 people) with a common leader, complimentary knowledge and skills who are committed to common goals for which they hold themselves mutually accountable.” Now, that caught my interest. He went on to explain that a high-performance team has three components: high performance talent, high performance motivation and extraordinary leadership. The role of the leader is to mobilize others to execute the strategy and deliver the results that create value. So, how do you build such a team? First off, you need alignment — a shared direction. All team members need to have the same understanding of purpose (why do we exist), mission (where are we going), values (what do we believe in) and strategy (how will we get there). Crucial also is to have a clear understanding of each team members’ role — what is expected of the individual and the team with shared performance goals and transparent accountability. Dr. Perry asked us all to think back on when we were part of a high-performance team and what made it so. My neighbor recalled the camaraderie of his winning college football team; I thought of a cross-functional team that had major commercial success. Contrary to common belief, a strong team is not about friendship. It’s about trusting the team members to have the skill, will and way to get the job done. Each team member needs to be committed to the vision, goals, strategy and culture of the team. Dr. Perry pointed out that alignment is not commitment. The latter goes far beyond the label only and needs to be evidenced in the team members’ actions. You’ll need to bring together the right mix of people and they all need a thorough understanding of their role — of when and where they need to be involved, and when they can leave it to their team members. Key is to build openness, trust and consistent communication out to the team on any resolutions to ensure the team’s retained focus on the bigger picture. Besides these attributes, organizations also need to realize that teams are mostly project-based and not “forever.” There needs to be a time orientation — a moment of delivering results. In terms of strategy, all team members need to agree on the plan of action and diligently execute against it even if they may not fully agree on the strategy. Instead of going rogue, they should alert the team and go back to the drawing board if needed. Focusing on the plan and the process is essential, rather than making solo adjustments on the fly. 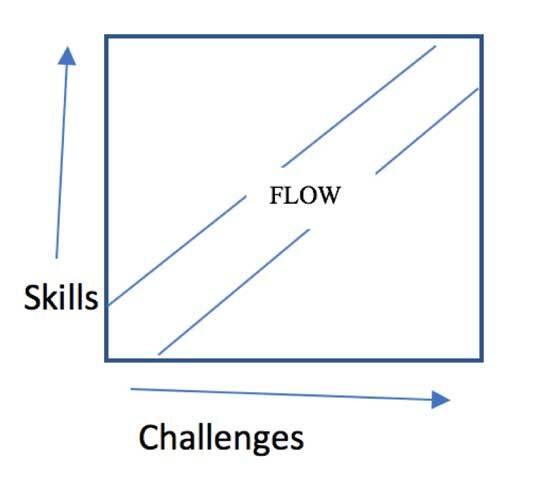 As his final point, Dr. Perry discussed the concept of enabling “flow.” To skip the lofty definition, flow comes down to finding the perfect match of skills versus challenges for each team member. Think of Alex Honnold, the first person to free solo climb El Capitan in Yosemite. He has been free climbing since childhood and built up unmatched climbing skills. After a yearlong of practice runs, he knew every grip and foothold. It was time to up the challenge, remove the rope and he climbed the mighty, 3,000-foot granite wall within four hours. He was in flow. People will do things, even at great cost, for the sheer joy of doing it. Have you ever been in flow? You started working and before you knew it, hours had passed quite pleasantly and productively. You found your perfect match of skills and challenges in that moment. That’s flow. What do you know — my plane is about to land and I’ve made it back from Houston. There’s nothing like flying in flow!